The committee met, pursuant to notice, at 9:30 a.m., in room Sd-366, Dirksen Senate Office Building, Hon. James A. McClure (chairman) presiding. Present: Senators McClure, Domenici, Wallop, Warner, Murkowski, Nickles, Hecht, Bumpers, Metzenbaum, and Melcher. Also present: K. P. Lau and Marilyn Meigs, professional staff members; and Benjamin S. Cooper, professional staff member for the minority. The Chairman. The committee will come to order. The April 26 accident at the Chernobyl nuclear reactor in the Soviet Union has stimulated a lot of interest in a myriad of issues related to the continued use of nuclear powerplants in this country and abroad. 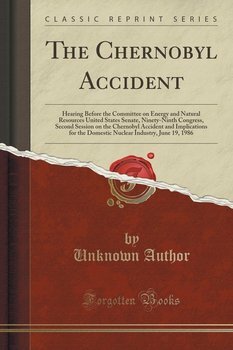 From members of this committee, we have had expressions of concern about the immediate and long-term health effects of the Chernobyl accident, the safety of our U.S. commercial and defense reactors, the need for licensing reform, and the accidents overall impact on the world energy supplies. From an international perspective, we have already seen an increased interest in expanding the role of the International Atomic Energy Agency with respect to nuclear safety issues, including the negotiation of international agreements for early notification about nuclear incidents, and coordinating emergency response and assistance in the event of a nuclear accident that releases radioactivity into neighboring countries. I wish to commend the Iaea for the responsiveness it has already shown in the wake of the Chernobyl accident, and its actions have reinforced my conviction that the Iaea is an invaluable body for the promotion of responsible use of nuclear power throughout the world. From the perspective of our domestic use of nuclear power, I am not surprised that the accident at Chernobyl has caused us to once again assess the adequacy of the designs, safety features, and regulations of all our operating nuclear reactors. The New Citizen, Vol. 1 Voss E. E.
The Statutes at Large of the Confederate States of America, Passed at the Fourth Session of the First Congress, 1863-4 Matthews James M.
I LIKE MY BEER DIET Lipp Martin R. M.D.